SCVHistory.com LW3427 | William S. Hart | 'Riddle Gawne' (1918): Publicity Still No. A47-61. Original publicity still No. A47-61, 8x10 inches, linen backed. 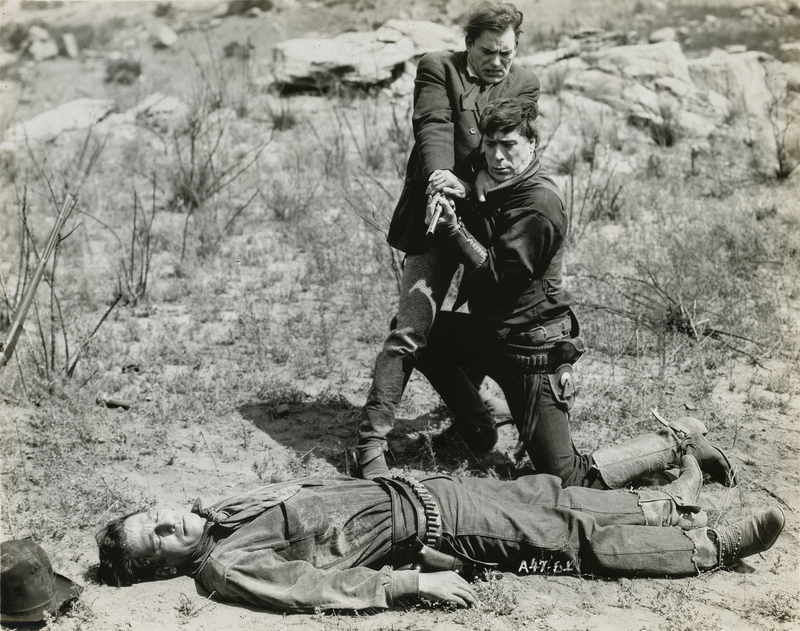 Hart portrays the title character who is determined to avenge the murder of his brother and the abduction of the love interest (Katherine MacDonald) by the villain Hame Bozzam, played by Lon Chaney ("The Hunchback of Notre Dame," "The Phantom of the Opera"). With "Riddle Gawne" Hart began the practice that he would repeat many times: he proposed marriage to his leading lady, in this case the lovely Katherine MacDonald. Convinced that he was in love with MacDonald, Hart asked her to marry him a dozen times without success. Those who knew Hart best found his many proposals humorous, and no one, including the ladies involved, was sure how serious he was. Three years later, one of them took him seriously. The 57-year-old actor's whirlwind marriage in late 1921 to the 22-year-old starlet Winifred Westover was over by early 1922. Evidently Hart kept up his friendship with Katherine MacDonald; she attended the formal unveiling in 1924 of the James Montgomery Flagg portrait of Hart that now hangs in the Hart Mansion in Newhall and "made a fuss over him" (Flagg 1925:165). Produced by William S. Hart Productions; advertised as "supervised by Thomas H. Ince;" distributed by Paramount-Artcraft; released August 19, 1918; ©August 3, 1918; five reels (4757 feet). Directed by William S. Hart; screenplay by Charles Alden Seltzer from his story "The Vengeance of Jefferson Gawne;" photographed by Joe August; art director, G. Harold Percival; assistant director, Lambert Hillyer. CAST: William S. Hart (Jefferson "Riddle" Gawne); Katherine MacDonald (Kathleen Harkness); Lon Chaney (Hame Bozzam); Gretchen Lederer (Blanche Dillon); Gertrude Short (Jane Gawne); E.B. Tilton (Colonel Harkness); Milton Ross (Reb Butler); George Field ("N-----" Paisley); Leon Kent (Jess Cass). LW3427: 9600 dpi jpeg from original photograph purchased 2018 by Leon Worden.